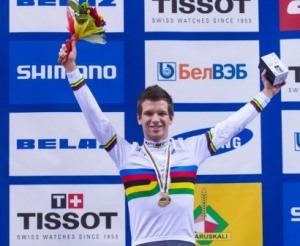 Twenty-two year old omnium rookie Aaron Gate had an agonising wait before being crowned track cycling world champion in Minsk, Belarus today. Gate won the gruelling six-discipline with a magnificent display on the second day, winning two of the three events and beating his two key rivals in the other. It was a stunning performance in his first omnium at international level, beating off the challenges from defending world champion Glenn O’Shea (AUS) and Olympic champion Lasse Norman Hansen (DEN). Gate had a 10 minute wait for a re-ride by O’Shea who suffered a mechanical issue with his bike but the Australian was unable to match the time, meaning the Kiwi had won the gold medal and cycling’s famed rainbow jersey. “It’s not sunk in. I was an unknown really because I’ve not really done one before so to come away with a world title is every cyclist’s dream, so I couldn’t be happier,” Gate said. It proved a nervous wait for O’Shea’s re-ride. “The heart was pumping. I knew he (O’Shea) was a team pursuiter too and would be able to ride a good kilo. I couldn’t really celebrate until after that ride. He was holding second place really close right up to the last lap. It was a pretty nerve-wracking few minutes. It is the second omnium world title claimed by a New Zealander after Hayden Godfrey won in Manchester in 2008, and it is third medal won by the compact five-strong contingent in Minsk following the silver medals by the men’s team sprint and Simon Van Velthooven in the 1km time trial. There’s one more chance for a medal tomorrow with former triple junior world champion Sam Webster through to the semifinals of the men’s sprint, after disposing of the Olympic champion Jason Kenny (GBR) in two straight rides in the quarterfinal. Gate has worked hard on the timed races in the camp leading in to the championships with coach Dayle Cheatley, which bore fruit with fastest time in the flying lap on the first day. He repeated that effort with a personal best 4:21:60 to be fastest in the 4000m individual pursuit which moved him to a share of second place overall. While Britain’s world junior champion Jonathan Dibben and Jasper De Buyst (BEL) lapped the field to dominate the scratch race, Gate outsprinted his two key rivals for fourth placing, which took him into a share of the lead with O’Shea with Hansen falling two points behind in third. Hansen set the standard of 1:02.437 in the penultimate pairing of the final 1km time trial, while Gate had to get under the time of the second placed Lucas Liss (GER) of 1:02.949 and beat O’Shea in his first ever kilo in international competition in order to grab the rainbow jersey. O’Shea suffered a mechanical problem on his first lap but Gate was not put off, powering on in a solo ride to clock 1:02.271 to go to the top of the order, a time that would have won a medal in the individual discipline at the recent national championships. He then had to wait 10 minutes until the re-ride, but the Australian could only manage the fifth fastest time to ensure the young Kiwi had claimed the coveted rainbow jersey. “I wasn’t too sure what to expect about the flying lap as it was the first one ever at this level of competition. But I knew I had a good individual pursuit in me after the time I clocked at the national championships and the kilo is just everything else you have left in the tank and luckily I had enough left to post that time. It is such a great feeling,” Gate said. He is now hoping to add the omnium to the team pursuit aspirations for the 2016 Rio Olympics. National sprint champion Webster was in stunning form today, qualifying third fastest in 9.958s, the first time the 21 year old Aucklander has gone under the magical 10 second margin. It is the fastest time that a New Zealander has ridden at sea-level, pipping the 9.963s set by Eddie Dawkins in qualifying at last year’s championships in Melbourne, although compatriot Matt Archibald went faster at altitude in January’s World Cup meet in Mexico. Webster was untroubled in dispatching Frenchman Charlie Conord and Spain’s Juan Peralta Gascon in the first two rounds of single elimination races. 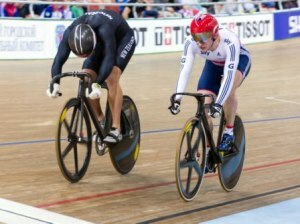 The former triple world junior champion faced the might of the Olympic gold medallist Jason Kenny in the best of three quarterfinal, with the Englishman coming to the championships in strong form, winning the keirin gold medal on the second day. Webster came over the top of Kenny to win the first ride and held him off after going early in the second ride to move through to the semifinal and add a much-sought after scalp to his belt, averaging 71kph for the final lap in the process. Van Velthooven was 11th fastest in qualifying in 10.103s before disposing of Australian Andrew Taylor and Great Britain’s Matthew Crampton in the first two rounds. However he was beaten by Germany’s Stefan Botticher in the deciding third ride of the quarterfinals and settled for eighth place in the bunch ride for the minor placings. Ethan Mitchell (Auckland), qualified 17th fastest in 10.164s but was eliminated by Australia’s Matthew Glaetzer in the first round. Webster is the only New Zealander in action on the final day of competition. Sprint qualifying: Francois Pervis (FRA) 9.879, 1; Robert Forstemann (GER) 9.924, 2; Sam Webster (NZL) 9.958, 3. Also: Simon Van Velthooven (NZL) 10.103, 11; Ethan Mitchell (NZL) 10.164, 17. First round: Webster bt Charlie Conord (FRA) 1-0; Van Velthooven bt Andrew Taylor (AUS) 1-0; Matthew Glaetzer (AUS) bt Mitchell 1-0. Second round: Van Velthooven bt Matthew Crampton (GBR) 1-0; Webster bt Juan Peralta Gascon (ESP) 1-0. Quarterfinal (best of 3): Pervis bt Glaetzer 2-0; Stefan Botticher (GER) bt Van Velthooven 2-1; Sam Webster bt Jason Kenny (GBR) 2-0; Denis Dmitriev (RUS) bt Maximillan Levy (GER) 2-0. Ride for 5th to 8th: Glaetzer 5, Levy 6, Kenny 7, Van Velthooven 8. Omnium (day 2), 4000m individual pursuit: Aaron Gate (NZL) 4:21.60, 1; Lasse Norman Hansen (DEN) 4:22.73, 2; Artur Ershov (RUS) 4:25.92, 3. Points after 4 events: Glenn O’Shea (AUS) 11, Hansen 12, Gate 12. 15km Scratch race: Jonathan Dibben (GBR) 1, Jasper De Buyst (BEL) 2, Ho Ting Kwok (HKG) 3. Also: Gate 5, O’Shea 6, Hansen 7. Points after 5 events: Gate 17, O’Shea 17, Hansen 19. 1km Time Trial: Gate 1:02.272, 1; Hansen 1:02.437, 2; Lucas Liss (GER) 1:02.949, 3. Final points: Gate 18 points, 1; Hansen 21 points, 2; O’Shea 22 points, 3.